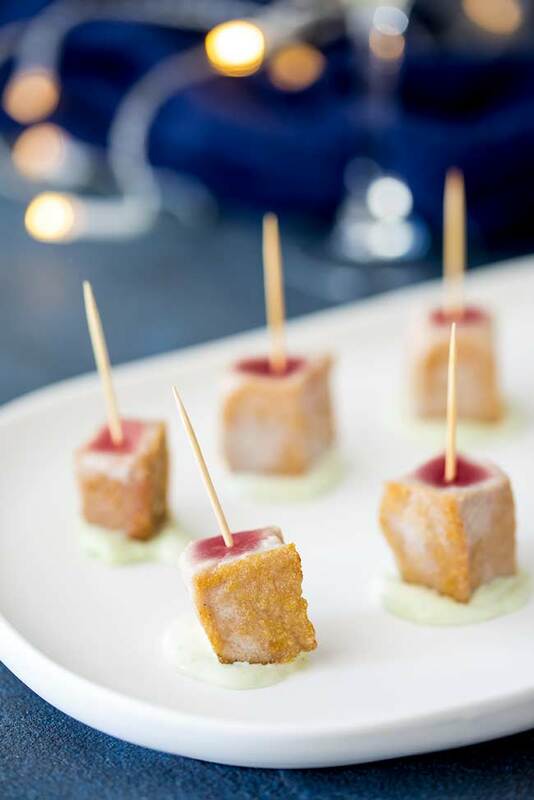 These seared tuna skewers with their golden crisp crust and ruby red centre are a cute and easy way to serve fresh tuna, especially when paired with the smooth and spicy wasabi cream. Crunch, spice, cream and melt in the mouth all together in one delicious Hors d’oeuvre. What tuna should I use for tuna skewers? I like to buy Ahi tuna for these skewers, it has a great flavor and is an affordable way to serve tuna to a crowd. Also it has a great color which makes the contrast between the exterior and interior so beautiful. But be guided by the fishmonger (either at the supermarket or your local fish market) they will know which is freshest and which is great value for money. How long do you cook tuna for? 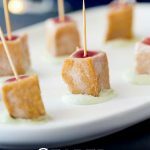 I love the jewel bright centre of these tuna skewers, so I cook my tuna for about 30-45 second on four sides of the cubes. This gives you a gorgeous crisp crust and keeps the inside soft and bright. Plus only cooking on four sides means you can see the wonderful change in colors when you present these on the platter. Is the Wasabi Cream really Spicy? So I have made this wasabi cream much more delicate and much more of a crowd pleaser. It has the wonderful flavor of wasabi but the sour cream and mirin add a creamy sweet edge, toning down the super spice. Taste your cream, if you want more spice then add a little more wasabi. 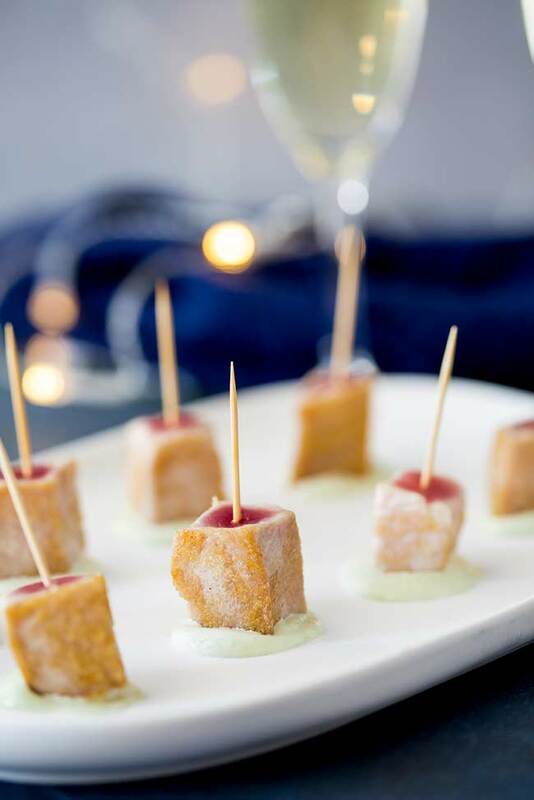 p.s if you love seared tuna then why not try my Seared Sesame Tuna Bites they are a quick canapé idea that would look stunning on platter with the tuna skewers. 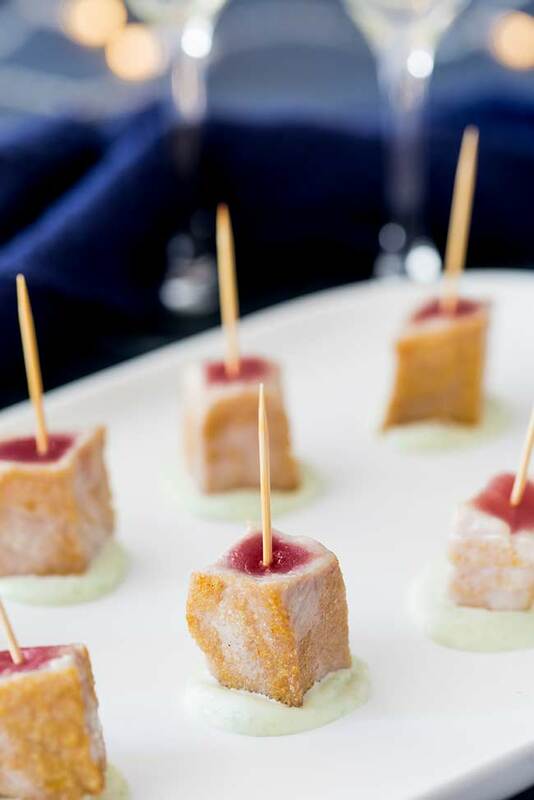 These seared tuna skewers with their golden crisp crust and ruby red centre are a cute and easy way to serve fresh tuna, especially when paired with the smooth and spicy wasabi cream. Crunch, spice, cream and melt in the mouth all together in one delicious Hors d'oeuvre. Cut the tuna into 1" cubes. Combine the oil, lime zest and a generous pinch of salt in a bowl. Add the tuna cubes and stir gently to combine. Cover and place in the fridge for 15 minutes. Preheat a griddle pan (or BBQ) to high. Skewer each tuna cube with a cocktail stick and then sear the tuna for 30-45 seconds on four sides of your cube. Leave the top and the bottom un-seared to create the two tone affect. Combine the sour cream, wasabi and mirin in a small bowl. taste and add more wasabi if needed. Cover and place in the fridge until required. 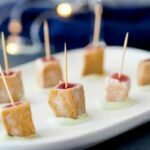 If you love food why not subscribe to my newsletter, I will drop you an email every now and then, just to say hi and send you a couple of recipes think you might love, like these Seared Tuna Skewers with Wasabi Cream. The wasabi cream sauce adds so much delicious flavor to the tuna, such a great appetizer recipe! These are SO delicious. They look AMAZING for parties and events b/c they’re just so perfect and put together…that being said, I don’t think we’ll be able to wait for another party to make them again! They are just stunning when they are all spread out on the plate aren’t they!